Employee lockers are the best fixtures for keeping personal belongings safe and secured during working hours at large businesses, like offices, warehouses, and retail stores. 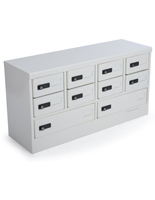 Place these steel storage cabinets in staff lounges, break rooms, company gyms, or simply around the office to provide a place for workers to store their purses, coats, wallets, and even cell phones! 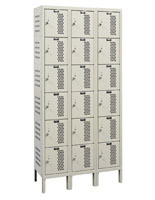 All of our employee lockers either already come with combination locks or are ready to be easily fitted with them. Your staff would just need to bring a lock from home or you could hand them out! Most models also feature ventilated sides to stop any smells from forgotten uniforms or lunches from getting too putrid. Plus, these office storage lockers arrive already assembled. All you need to do it place them in our break room, locker room, or lounge area! 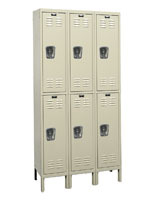 When picturing lockers for employees many envision the halls of their old high school lined with those classic steel cabinets. While traditional models are still a popular fixture, in this day and age a new style of employee locker is becoming necessary. 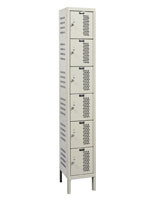 If your staff does a job that requires them to become unglued from their smartphones during a shift, then cell phone lockers may be a great choice. 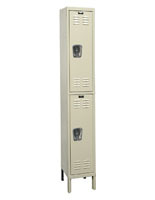 Employees can reluctantly and safely store their cell phones in these special lockers while they work. Hospitals, government facilities, and manufacturers are just a few of the businesses that use these models. So, what are you waiting for? 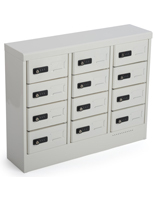 Equip your business with these locking storage units today! Your staff will thank you!